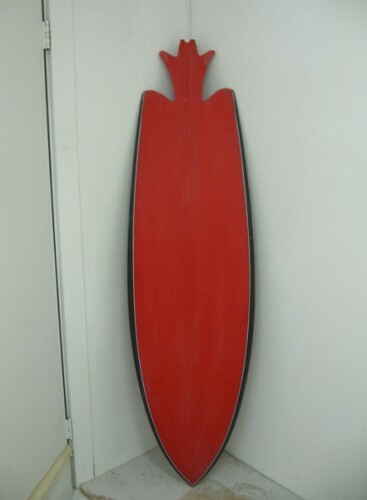 Steve experimented with some finless designs in the mid-1970s. Back then, he shaped a 5′10, 20-1/4 wide fish and added a flexible Fang tail to see if it would help a finless board hold into the wave. He found out that the Fang, as long as it was in the water, would help him make bottom turns to set up his rail for the speed runs. 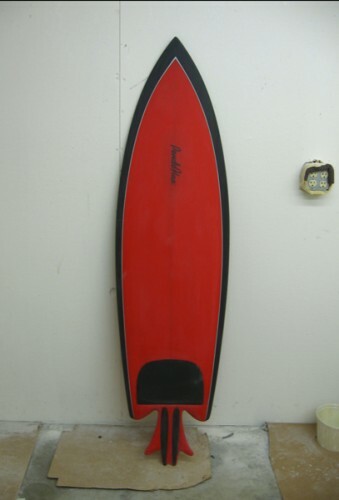 With all of the recent activity with alaias and the like, Steve remembered his boards from years ago in the 1970s, thus we now have the Pendoflex Fang. Fang and some other derivative terms for the tail protrusion are boundless, but our term Fang comes from a Grand Prix racer from the early 1960s. He was really fast on the race track, thus the quote “He was really fangin’ it!” Fang also has an edge board-inspired footwell on the deck where Steve has inlaid the little black foot pad. Meet the Pendoflex Fang, inspired by one of Steve’s boards that we have from 1975 that he pulled down from the rafters. Fang is 5′11 and 19-3/4 wide. Fang will be shown by the United by Insanity folks Logan and Webster at the Art Expo in NYC on March 25-28. Check them out in Booth 139, they will have other boards by Steve and other excellent, creative shapers. We hope that you enjoy the photos. A link to Art Expo New York is below. One Comment on "Meet the Pendoflex Fang"
WOW! This is the craziest thing I have ever seen! I love it. « 5′10 Pendoflex arc tail quad for Matt!